Editor's Note: The original August 16, 2016 report stated that the baby was a boy. This article has already been updated. 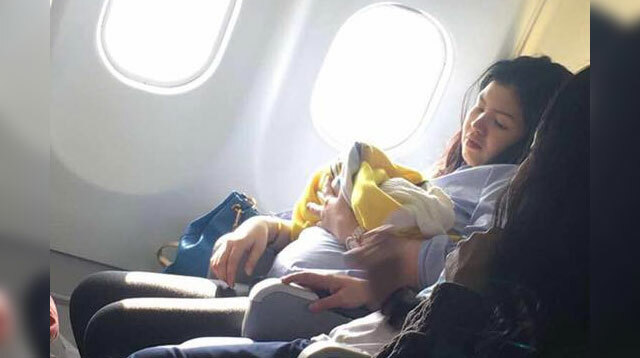 Missy Berberabe Umandal—a passenger aboard a Cebu Pacific flight on its way back to the Philippines from Dubai—recently shared that a fellow passenger who was pregnant started having contractions about five hours into the flight. The pregnant passenger, who was traveling with her mother, was set to give birth in October so she was reportedly just as surprised as everyone else when she started going into labor. In her viral Facebook post, Umandal related, "[The] flight attendants started calling for medical assistance and, luckily, there were two nurses among the passengers." She went on to recall, "[The baby] was already crowning, so the woman was brought to the more spacious area in front of the plane. We only heard one semi-loud screech and, a few seconds later, there were tinier, cute screeches, and it was when we knew the baby was born." And the baby was a girl! Umandal then observed that the flight attendants then detached one of the plastic shelves from utility cabinets and filled it with mineral water, turning it into a makeshift wash basin to clean the baby in. "It was immediately decided that an emergency landing in India was necessary to ensure the baby's health, as [she] was born two months earlier than expected," Umandal explained. Due to its emergency landing in India, the Cebu Pacific flight from Dubai was delayed. Umandal said that "what was supposed to be a nine-hour flight became roughly 18 hours" but there were no complaints from the passengers. An ABS-CBN News report noted that a baby born on a ship or aircraft will take the "citizenship" of the airline. This is according to the United Nations Convention on International Civil Aviation, under the 1961 Convention on the Reduction of Statelessness. Cebu Pacific is registered in the Philippines, so the baby is definitely Filipino. The report explained, "Previously, women who are beyond six months pregnant were encouraged not to board a plane. These days, some airlines allow pregnant passengers on flights as long as they have clearance from their OB-Gyne." Lance Gokongwei, Cebu Pacific Airlines President and CEO, gave an official statement confirming baby Haven's birth: "[We] would like to commend our flight and cabin crew for handling the situation with utmost professionalism and efficiency. We also express our sincerest gratitude to the two volunteer nurses who helped ensure the baby's safe delivery." He also granted the baby and her family rewards points that they can use to fly for free for life, "To celebrate this momentous occasion in the life of one of our passengers, CEB awards Baby Haven one million GetGo points, which she can use to fly with us for free." Additional report by Tess Koman.